When you need a lot of CDs, DVDs, or Blu-ray discs ready with your content (and you need them quick), disc duplication is the key. Here you will learn all you need to know about the process, the tools and equipment, and helpful hints on important decisions you will make with your duplication needs. What is duplication? 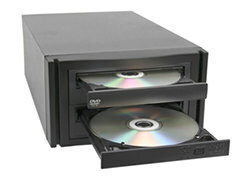 Duplication is the process of burning content onto a disc with a CD or DVD recorder, such as an in-home computer, duplicator tower, or stand alone recorder. Disc duplication is one of two processes used to copy a large number of discs for retail, promotional, personal, artistic, or corporate purposes.